Our Twitter followers will already know from seeing some of our French-themed snapshots that I am currently combining a summer break in the South of France with a travel feature for The Sloaney. As you would expect, the weather is glorious and I spent most of yesterday relaxing on the beach in Cannes. However, whilst many of us love to sunbathe – and this often forms a vital part of the holiday programme – we also need to look after our skin. Whilst taking a stroll along the Promenade de la Croisette I saw the sorry sign of severe sunburn far too often. Not only did it look extremely painful, but some people were continuing to bask in the rays regardless of their bright red burn marks and prickly heat. I have thus been prompted to write a feature about the importance of looking after your skin whilst in a warmer climate to help prevent cancer and also assist with anti-aging. According to experts from the MOLE Clinic, there are now over 12,000 cases of malignant melanoma (the deadliest form of skin cancer) in the UK each year, which equates to about 35 people every day. Skin cancer is on the increase and malignant melanoma incidence rates in Britain have more than quadrupled over the last 30 years. Despite cases being more common with increasing age, melanoma is actually disproportionately high in younger people. The main cause is sunburn and sunbeds; the latter, in particular, significantly heighten the risk of skin cancer. In fact, using sunbeds for the first time before the age of 35 raises the chance of developing melanoma by 87%. However, it is not only sunbeds that can do damage and any strong sunshine is dangerous. I always find the midday temperature in Cannes very oppressive as there is rarely a breeze. You will find yourself perspiring even if you are doing nothing more than just lying on a lounger. In such climates, it is really important to escape the strong rays by finding some shade at noon and during the early hours of the afternoon. Even if you are desperate to enjoy the sunshine, you can still relax in the warmth by curling up under a parasol to read a book. A good sun cream with a high SPF and UVA rating is also essential to protect your skin. I have spent many years trying to find the best sun protection; it has to be easy to apply, completely ‘burn proof’ and preferably have an exotic holiday scent! 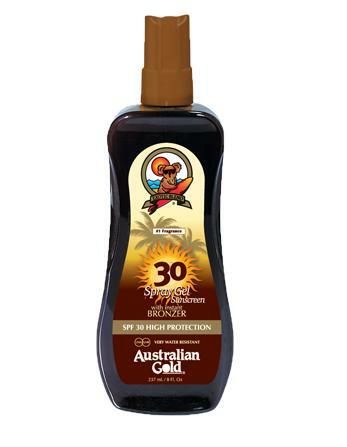 Australian Gold is by far the best product that I have tried on the market and it is nearly impossible to burn with this protection, when properly applied. The spray gel versions are the best and the range also includes tan extender and bronze enhancing options. The latter is ideal for encouraging an immediate sun kissed glow as it contains an instant bronzer element. Australian Gold is extremely popular in America and Australia but one of the only places I have been able to purchase the range in the UK is from beauty website Look Best. Knowing how your skin reacts in certain climates is also crucial. For example, if you are partial to prickly heat, make sure you pack a lot of cooling Aloe Vera lotion and suitable medication in your luggage. The need to be ‘Mole Aware’ is also important. This year, the MOLE Clinic is celebrating its 10th anniversary and aims to make even more people conscious of the risk of skin cancer and the importance of Mole Screening. Everyone should have a routine mole check once a year. If experts look over your skin on an annual basis, it will help with detecting any early skin cancers. Early detection can save your life, so it is vital to have your moles reviewed for any sign of changes, such as variations in the size, shape and colour. Melanomas have more chance of spreading the longer they are left. If you notice a mole is changing or evolving in any way, it is important that you have it checked out immediately by an expert from somewhere like the MOLE Clinic or your GP. You can still enjoy your time in the sunshine, but having awareness of the risk factors and taking some precautions will dramatically reduce your chance of skin cancer. It will also ensure you prolong your skin’s youth. With that in mind, don’t forget to pack your favourite cleanser, toner and moisturiser. We have lots of recommendations on our Beauty Pages. Happy Holidays!